*Research Question: What are the effects of repeated readings on the reading prosody and reading attitudes of sixth grade students with learning disabilities? Prosody = reading with expression and feeling. Prosody is a lesser-known element of reading fluency. Reading fluency encompasses the ability to read accurately. Although fluency is often thought of as simply the correct number of words read per minute (accuracy), prosody is another crucial element of fluency that should be considered as well. Think of how a robot would sound if it were to read out loud. It would be monotone, expressionless, and lifeless. It would probably ignore periods, commas, and pay no attention to things like exclamation points and question marks. A robot lacks prosody. When students read like this, their comprehension suffers, even if they are reading the words at the appropriate rate and speed. Often, prosody can be the missing link between true fluency and comprehension! Click here for more information about prosody. This study was completed in an Exceptional Children's classroom at a public middle school. It was of a single-group pre-/post-test design. Six sixth graders with learning disabilities were involved in a repeated reading intervention in hopes of improving reading prosody and reading attitude. Each student received the intervention in an Exceptional Children's supplemental reading class. In this study, repeated readings involved students working one on one with the teacher, reading the same piece of short text multiple times in one sitting. Check out the specifics of the repeated reading sessions in the chart below. Students received the intervention of repeated readings eight times over seven weeks, and pre- and post-tests were given to measure change in reading prosody and reading attitude. Click HERE to take a look at the specific prosody rubric used. Click HERE to see the reading attitude survey used. Did students' reading prosody improve? YES! Every student increased their prosody score by at least 25%! 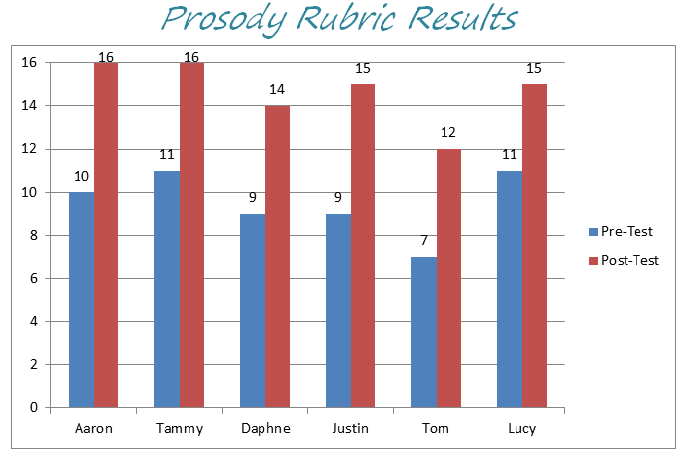 Take a look at the graph below to see how each student did on the pre- and post-test on the prosody rubric. Did students' reading attitudes improve? It is unclear. Results on the attitude surveys were mixed - some students' attitude toward reading improved, while others didn't. Take a look at the chart below to get a better idea. This study shows improvement in students' ability to read with prosody after the implementation of a repeated reading intervention. So, for this population of students, repeated readings help prosody. Just as past studies have shown, repeated readings can be useful when trying to address the area of prosody in our classrooms. What about reading attitude? This study does not provide strong evidence that repeated reading improves reading attitude. Many outside factors could have contributed to the change in reading attitude scores, so additional research is needed to provide better information regarding the relationship between repeated reading and reading attitude. Prosody is an essential part of being able to read fluently, and shouldn't be ignored. A lack of prosody will hinder a child's reading comprehension, no matter the rate / accuracy of their reading. Modeling is an important element of any instructional practice aimed at improving prosody. Students need to hear how it should sound. Reading with prosody is when your reading sounds like you are having a conversation with a friend. When you read with prosody, you read with feeling. Prosody means you are paying attention to punctuation: pausing at periods, making questions sound like real questions, and having some excitement at exclamation points. Prosody helps you better understand what you read! Again, click HERE for more information on prosody. Repeated readings have been around for a long time. There are tons of versions of this activity, but here are the specifics that were used in this research study to improve reading prosody. Hopefully you will find these elements as beneficial for reading prosody as the students in this study did! Click HERE for more information on repeated readings. It is important to remember that this study was carried out in a unique setting with unique students. Although much was learned from this study, it is important to replicate it in a way that fits with your unique situation. No one knows your students and their needs better than YOU!